Two black bears in a tree were tranquilized Tuesday. A mother bear and her cub were tranquilized in Amesbury after they spent much of Tuesday morning up a tree, much to the delight of locals who gathered to watch them. “With the assistance of Amesbury firefighters and police, Environmental Police and MassWildlife first immobilized the sow and relocated her to a wooded location, then immobilized the cub and relocated it to the same location,” said Katie Gronendyke, a spokeswoman for the state’s Executive Office of Energy and Environmental Affairs. “I think people were nervous about it because they were so high up in the tree,” Velleman said. The black bears started the day on one tree in the area of Atlantic Avenue and then came down, only to climb up another tree, said Tom Pettingill, an employee at the nearby Hillside Launderette. “It’s not scary; I think it’s a nice glimpse of nature,” said Sandy Gilbert, who saw the bears in a tree around 5 a.m. as she was retrieving recycling bins from outside her brother’s home on Elm Street. The bears were monitored closely in the tree by officials, Pettingill said. Firefighters arrived at the tree shortly before 10 a.m., officials said. 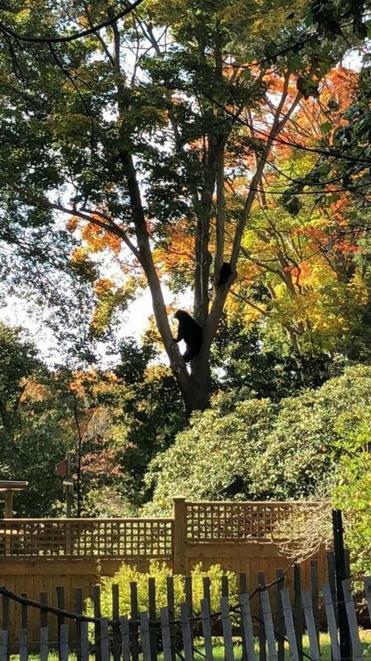 “Bears routinely climb trees and generally can descend safely, but it can be problematic when bears climb trees in populated areas, as crowds can gather and startle them, causing a risk to public safety,” according to a statement from the Amesbury Fire Department. Police kept their distance from the bears and made sure residents did, too, Gilbert said. Firefighters used a ladder truck to gain better access to the bears. The larger bear was tranquilized shortly before noon, causing it to fall about 100 feet from the tree and land on a tarp that officials had set up underneath, Velleman said. The smaller bear was tranquilized around 20 minutes later. The cub climbed higher into the tree before falling down, Velleman said. Both bears were tagged and treated with tubs of ice while they were tranquilized to keep them from overheating, fire officials said. Gilbert and Pettingill said they had never seen bears in Amesbury before. Black bears are common in New England, and their population is growing, but they tend to avoid people, according to the fire department.